How far would you travel to save your sibling? Or just to meet David Bowie? Jareth The Goblin King just stole Toby, Sarah’s baby brother. Sarah (played by the awesome Jennifer Connely) has until midnight to find her way through the tricky Labyrinth and get to the castle in the center of Goblin City before midnight or her baby brother turns into a goblin! 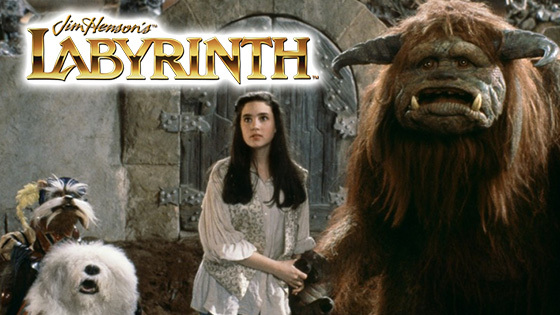 A timeless movie filled with music, magic, and art created by the legendary Jim Henson. What better way to experience this adventure than at the Franklin Theatre with the Movie Gang! Not only will you see this 80’s classic back on the big screen, we’ve also invited 3 of our favorite local artists and will be hosting an art show inspired by the film in the lobby! Our friends from Triple Crown Bakery in Franklin, TN will be giving out free custom Cookies honoring the Goblin King Jareth himself. Plus HOGGLE the jewelry hoarder and theif from the film is letting us pass out free RING POPS. We can’t wait to Dance Magic Dance! 7 PM Art show inspired by Labyrinth Featuring Local Artists: Alexis Colbert, Jeff Bertrand, and Lake Mills. Free Jareth The Goblin King Cookies from Franklin, TN’s Triple Crown Bakery. Free RING POPS. Taken from HOGGLES jewelry stash!